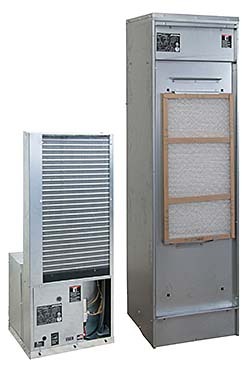 Tranquility Vertical Stack Series is a vertical stack product for ducted applications. Features iGateDXM2 controls to tune airflow in 25 CFM increments. Available in 3/4- to 3-ton capacities. Engineered for installation behind drywall, and top supply air discharge openings allow for easy configuration. Removable chassis allows staged installation. Uses HFC-410A refrigerant.